From the outstanding geology to the beautiful scenery in places like Rocky Mountain National Park to popular attractions like Red Rocks Amphitheater and the Denver Art Museum, it’s obvious why Colorado is one of the most visited states in the union. Boasting plenty of natural beauty and an incredible number of things to do and see, it’s no wonder that you’ve been dying to see Colorado. So what’s been stopping you? If you’re like most travelers, one of the biggest obstacles to any trip is expenses and planning. There are dozens of details that go into planning road trip – from securing places to stay along the way to planning ways to stay on-budget. Fortunately, we can help you avoid these problems with an RV rental in Colorado and make your trip as good as it can possibly be. When you’re ready to explore everything Colorado has to offer, there’s one sure-fire way to ensure that you make the most of everything and that is by having the right vehicle for the journey. While you could take the family car, there are plenty of constraints associated with traveling in your domestic vehicle. In addition to space being limited, domestic vehicles aren’t comfortable to sleep in and are often difficult to pack. With that in mind, it’s obvious that you need a sturdy vehicle that can eat up the miles while keeping you comfortable, safe, and happy. Fortunately, securing an RV rental in Colorado will help you address all of these problems at once. 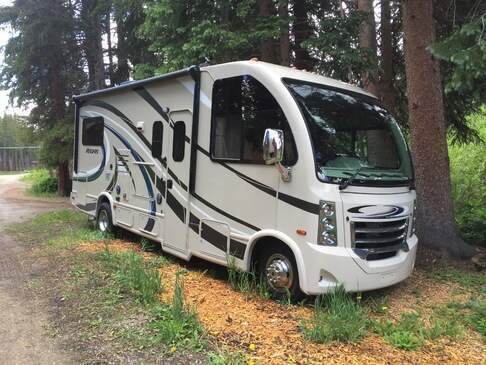 In addition to offering more storage capacity than any domestic car on the market today, RV rental Colorado also allows you to take your sleeping accommodations with you everywhere you go, creating a comfortable and customized travel experience you’re sure to love. Additionally, because the choice to rent an RV in Colorado saves you from having to shell out money on pricey hotels, you’ll have more in your travel budget to explore all of the attractions and fixtures of Colorado. Recreational opportunities. Whether you want to hike in Red Rocks Park or enjoy a powder day at Vail, there’s plenty to see and do in the great outdoors of Colorado. Don’t worry about bringing all the gear you may need, because our high-quality RV rental in Colorado offer ample storage capacity. Tourist attractions. When you’re tired of enjoying the great outdoors, head to the Denver Art Museum or take the family to the Denver Museum of Nature and Science. Colorado is rich with popular tourist attractions and we’re wiling to bet that you’ll probably want to see them all. Music. If you’re in the Colorado area in the summertime, you’ll enjoy taking in a show at Red Rocks Amphitheater or heading to the world-famous Telluride Blues and Brews festival. Alternately, catch some music at the Fillmore Auditorium or the Bluebird Theater in Denver. No matter what time of the year you visit this state, there will be plenty to do. Cultural attractions. Colorado is rich in ancient and Native American history and those interested in learning more about it can head to the famous Manitou Cliff Dwellings or Mesa Verde National Park. When you travel in an RV, you’ll go everywhere in style and comfort! This is just a sampling of the great things you can do in Colorado and, as you drive through the state, you’ll find hundreds of delicious restaurants, unique stores, and dozens of other attractions that will blow your mind and take your breath away. People who get an RV rental in Colorado are better-equipped to see everything the state has to offer while enjoying the experience and bringing everything they need with them. So take the trip at your own pace and ensure that you enjoy your Colorado experience by looking into our RV rentals today! Which RV Is Right for Your Colorado Adventure? Class A Motorhomes. Our Class A Motorhomes are designed for people who want to see Colorado from a large and luxurious RV. Complete with dozens of built-in amenities like satellite entertainment and navigation and air-conditioning in the cab, these RVs are perfect for big groups and discerning travelers. Class B & C Motorhomes. When you want the memories you make in Colorado to take center stage, rent a class B or C motorhome. These convenient options combine affordability with amenities to create an RV rental option that’s perfect for any budget or need. These are some of our most popular rental options and our friendly sales associates would be happy to tell you more about them today. Travel Trailers. A travel trailer is the perfect option for a traveler who wants a maneuverable RV rental option that doesn’t sacrifice amenities. Ideal for adventurers who want to camp in any of Colorado’s hundreds of rural and developed campsites, travel trailers are perfect for carrying all the gear you need for an unforgettable trip. Vans. For slightly more space than a domestic car without all the space of a larger motorhome, a van is the perfect option. Ideal for small groups with minimal luggage, these vans can help you see Colorado in style and comfort. When it’s time to rent your Colorado RV, look no further than Campanda. Thanks to our wide selection of budget-friendly options, we’re the go-to RV rental company in the Colorado area and we look forward to serving you! You can also check out our RVs in Denver, Colorado Springs and Fort Collins.